"The door of the human heart, can only be opened from the inside." 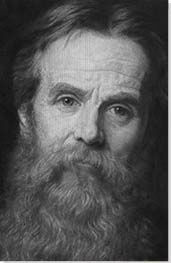 William Holman Hunt gained eminence initially as a founder member of the Pre-Raphaelite Brotherhood. Though the Brotherhood was short lived (some five years) Hunt remained true to its principles throughout his long career. A man of strong, some would say pious, Christian beliefs, Hunt was fastidious in his attention to picture detail and he used actual locations - many in the middle-East - to restage biblical parables and rituals in his canvases. Falling under the influence of the writings of John Ruskin, Hunt was invested in the principle of a spiritual truth and, like Ruskin, he believed that the job of the artist was to depict things truthfully while using art to promote and uphold moral integrity. Following a series of spectacular artistic triumphs, Hunt became seduced by the idea that he had been blessed with divine genius and his artistic energies were channelled into producing works that would challenge what he saw as the fashion for expressive indulgences in Academy paintings. His was a commitment rather to producing 'higher meaning' through what he called simply "good pictures". Leading the Pre-Raphaelite Brotherhood movement, Hunt, with colleagues John Everett Millais and Dante Gabriel Rossetti, challenged what they saw as the artifice and decadence behind the era's fashion for dramatic historical narratives. Hunt was committed to a less romantic, more honest art, and, in looking back to a period before the High Renaissance, Hunt sought divine inspiration in the purity and symbolism of medieval and religious fables found in 15th-century Florentine and Sienese painting. The son of devout parents, Hunt came to see himself very much as an agent of Christ. His paintings were revered and criticized in equal measure for their piety and the artist's painstaking attention to detail. His canvases, often characterized by the vitality of their lighting and color, gained praise (and condemnation from the likes of Charles Dickens no less) for the way Hunt treated bible stories and medieval themes with an unabashed realism. In response to his critics, and executed in a tone of unabashed self-promotion, Hunt would go on to publish a series of articles through which he advanced a staunch defence of the Brotherhood's ideals and, indeed, his starring role as principal in its formation and development. Falling under the influence of the polemicist (and patron) John Ruskin, Hunt found spiritual intensity in the precise elegance in figurative archetypes, and in objects found in nature. 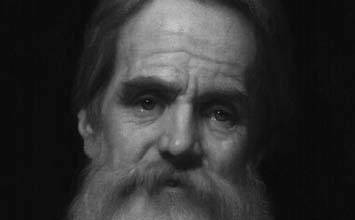 For some of his most renowned works, Hunt had travelled to the Holy Land in order to bring a contemporaneous truthfulness to his religious narratives. Moreover, Hunt believed that it was the duty of the artist - especially so in these times of new scientific enlightenment - to promote moral values through their work. And though his earnest parables were infused with Christian symbolism, they carried extra integrity in their earthly geographical staging. Hunt's most famous and influential work, The Light of the World (1853), brought the artist international fame. The painting, a contemporary portrayal of Christ, gained huge popularity, especially in Victorian England and America, and its appeal reached well beyond the confines of the rarefied art world. The painting became popularized with the help of an engraved version, and through its subsequent inclusion in sermons, devotional poetry (such as John L. Tupper's The Light of the World (1955)) and book illustrations. The work's popularity convinced Hunt that the spiritual symbolism expressed in the painting had connected directly with a collective public consciousness, and for that reason alone, Hunt believed that The Light of the World had fully vindicated his artistic mission. The child of humble working-class parents (his father earned his living as a Cheapside warehouse manager) William Holman Hunt (he changed his name from Hobman Hunt on the discovery of the fact that a clerk had misspelled his name on his baptism certificate) was raised as a devout Christian, dedicating his early childhood to reading the Bible in its finest detail. This being Victorian England, Hunt began his working life aged just 12 as an office clerk. It would take a further five years before his parents agreed, albeit reluctantly, to his enrolment at the Royal Academy art school (in 1844). Once there, Hunt made the acquaintance of John Everett Millais and, a little later on, the painter and poet Dante Gabriel Rossetti. The Awakening Conscience depicts a mistress rising from the lap of her lover, elevated - or enlightened - by a sudden realisation of Christian truth. As in many of Hunt's paintings, the theme of the picture is salvation, symbolized here by a shaft of light falling at the bottom right of the scene in an otherwise darkened interior picture frame. The painting is saturated with potential symbolism, from the gentleman's discarded glove - an allusion perhaps to how easily the woman could be cast aside - to the cat which is toying with a helpless, broken-winged bird. The picture is lent a distinctive style by the sumptuous and finely detailed interior decoration, a style familiar from contemporaneous works (such as Robert Tait's depiction of Carlyle's House). The symbolic mood of the picture, however, taints these material refinements with the added suggestion - or condemnation - of decadence. The rounded upper edge of the painting imitates the religious art of a dour historical past. But here we see evidence of Hunt's preference of working onto a brilliant white (rather than black) base, which he referred to as a "tempera" ground: that is an attempt "to treat the canvas support like a gessoed, quattrocento panel", according to the art historian Carol Jacobi. Certain intriguing personal details surround Hunt's execution of the work meanwhile. His model for the picture was Annie Miller, a fifteen-year-old barmaid. Writer and curator Jan Marsh has explained the background: "Reading her possible fate into the subject of his Awakening Conscience... Hunt had arranged for her education... with the unspoken aim of making her his wife." Hunt seems to have got lost then between the aspirational Christian message of his painting, and his own pursuit of the young model. The frame of the work was designed by Hunt himself and, it too, is laden with symbolism through a star as a sign of spiritual revolution. On the spandrels of the painting (which are covered when the work is framed), Hunt later described in fastidious detail a restoration of the work which he conducted in 1882. The Light of the World was Hunt's first critical success. Widely praised when it was exhibited at the Royal Academy, the work is an allegory, suggesting that Christ may knock at your door but the sinner must first answer that call if he or she is to find salvation. Indeed, Hunt felt that with art he had found his Christian calling. As he remarked in a letter to his friend W.B. Scott: "I painted the picture with what I thought, unworthy though I was, to be divine command and not simply a good subject." There is then a clear sense in which Hunt's paintings were much more than material constructions; they were moral parables too. Here for instance we see a manipulation of light in the picture that is in keeping with the idea that only a faith in Christ can deliver the sinner from darkness. Jacobi has noted additionally that, in keeping with his fine sable brush technique, and the admixture of varnish and oil paints, many technical aspects of Hunt's work took on "the quality of glass" and in so doing enhanced "the sense that the image is [being] viewed through a window rather than on a plane." This is especially true of The Light of the World which almost appears to glow (though that effect is hard to replicate through reproduction). Shortly after its exhibition at the Academy the painting was bought by Hunt's main patron Thomas Combe. On the event of her death in 1891, Combe's wife bequeathed £3,000 to be used to build a side chapel for the painting at Keble College, Oxford. Space was made in the south transept of the College's chapel by elevating the organ to a loft overhead. The painting is housed at Keble to this day. This is a rare and interesting example of a non-figural painting by Hunt. Whereas the majority of his output was polychromatic (and figural) Hunt's depiction of the Thames is notable for its subdued, dour palette and its atmospheric subtlety. A little over half of the picture plane is occupied by the surface of the river and Hunt has paid careful attention to the reflections and texture in the water. Though the title of the work refers to Chelsea, Hunt's studio was on the wrong side of the river and this picture looks out towards Battersea on the opposite bank. Chimneys loom above the horizon and the night seems heavy with smog. But for an area at the top left of the picture, the sky is blotted with a thin, dark, brushy layer of paint. There is a suggestion of moonlight in the reflections on the water at bottom left. These consistent horizontal bands of reflection are contrasted by the long, vertical reflections cast by lights from the warehouses on the right-hand side of the picture. Chelsea was home to a large population of artists around this time and, in the later decades of the nineteenth century, the Thames riverside became a popular subject for artists. The Thames at Chelsea was most famously painted and etched by Whistler (Hunt's nemesis according to several accounts) and his amanuensis Walter Greaves. Hunt's contribution to this subject is less well known yet this picture was painted around six years before Whistler's earliest depiction of the Thames. It is unclear if Whistler knew of Hunt's painting, but the Thames had been transformed into a subject worthy of detailed atmospheric observation earlier in the century by Turner (in works such as Moonlight, a Study at Millbank). Indeed, the crepuscular setting, the attention to industrial grime, and the choice of Chelsea - rather than a more rural, picturesque, stretch of the Thames like Richmond or Twickenham - marks this painting by Hunt as an important moment in the changing representation of the Thames in British art. This painting - one of Hunt's most iconic - depicts a floppy-eared goat which Hunt presented as a symbol of Christ. As with so many of his paintings, The Scapegoat combines studious attention to Christian scripture with contemporary iconography. For this work, he had in mind some verses from the Book of Leviticus (16:20-22) where the text describes Aaron, the High Priest, laying his hands on the goat and confessing the sins of the Israelites. "And the goat shall bear upon him all their iniquities unto a land not inhabited: and he shall let go the goat in the wilderness." In Hunt's Christian imagination, the goat foreshadowed the sacrifice of Christ. The landscape setting is atmospheric and luminous with the blazing yellow sky set in vivid contrast to the purplish mountains. The stricken goat's hooves push through the salt-encrusted foreground, and every aspect of the picture surface has been carefully enunciated. Hunt painted The Scapegoat during his first visit to the Holy Land between 1854 and 1856. Despite their shared beliefs, John Ruskin took a dislike to the painting: "This picture, regarded merely as a landscape, or as a composition, is a total failure" he judged. Nevertheless, alongside the religious symbolism of the painting, Hunt's style of vivid coloring and finely executed detail had an unconcealed pious motivation that would have met with Ruskin's liking. As Jacobi observed in her monograph on Hunt, "[p]aintings are essential proofs, empirical acts of witness of a spiritual hierarchy not just in their subject matter, but in every natural detail." By lingering over the details of his scene, then, Hunt was not chasing an incidental realism so much as a narrative on the themes of injustice and sacrifice. As with the other works that Hunt made in the Holy Land, this scene vividly reimagines a conventional Biblical fable: the crucifixion of Christ (no less). The painting foreshadows Christ's death on the cross and seems to mark the moment when Christ, realizing his fate, mimics his imminent crucifixion. His shadow falls squarely across the rack of tools on the wall, which serves as a notional representation of the wooden cross. The details of the painting are meticulous, from the screw on the workbench in the background, to the landscape of Nazareth as partially viewed through the window. Various elements in the picture can also be read as symbols of Christ's life and death, with the red headband at Christ's feet alluding to the Crown of Thorns that he would wear, and the star-like tracery in the window perhaps alluding to the star that marked his birth. If we put to one side the specific symbolism and the artist's signature stylistic traits, the image is of historical interest for Hunt's insistence on literal accuracy. On a denotative level, we see an Eastern man, caught in a state of strange exultation, as his shadow strikes the back wall. The apparent depth of the man's rhapsody is in conflict meanwhile with his surroundings and the detritus of wood shavings that cover the workshop floor. As Gissing explained in his biography of Hunt, the artist endured many practical difficulties in completing the work. His first choice model was a man from Bethlehem but progress was frustrated when Hunt decided that the model's skin had become too heavily tanned after so many hours spent in the sun during the course of sittings. Eventually Hunt decided that this model was too thin in any case, and another model was found. The fact that Hunt refused to paint from his imagination was further evidenced in a despairing letter sent to his friend W.B. Scott at the time of painting: "I have no confidence I shall get my picture done" he said. "Much depends on the weather [and] lately it has been so wet and windy I have not been able to get out of doors to paint." When the work was finished, however, the painter George Frederic Watts praised Hunt's diligence and integrity, recommending the painting for its "religious poetry in the allusion to the dignity of labour." This painting (one of two canvases; one large, one small) depicts the centuries old tradition, of obscure Pagan origin, of singing at dawn on May Day, which is still held annually at the top of Magdalen College's chapel tower in Oxford. As was his habit, Hunt - who in his words wanted to "represent the spirit of a beautiful, primitive and, in a large sense, eternal service" - laboured long and hard over the details of this painting. He spent a period of some eight months in Oxford, between May 1888 and January 1889, and for several weeks he worked on his canvas at the top of the tower, observing the pattern of the light and the behaviour of the early morning clouds in spring. Though they appear fantastic in their brilliant pink constellations, the clouds in the sky were in fact derived from Hunt's fastidious observations. However, in a letter (written in September 1888) to the artist and organist John Varley Roberts, Hunt conceded that his poor health and failing eyesight meant he would be "taking artistic licence in departing from the strict law of the ceremony". Once he had painted the setting, Hunt returned to his studio to execute the figures, all of whom have carefully rendered portraits, of elder Magdalen 'worthies' including (from left to right) the Professor of Physiology, John Burdon Sanderson (Fellow), the Professor of Music, Sir John Stainer (Organist), the theologian Henry Bramley (Fellow), John Bloxam (Fellow), and Herbert Warren (President). It is also rumoured that one of the young choristers in the foreground is based on Hunt's own son. May Morning in Magdalen Tower, which was framed in a circular copper repoussé designed by the artist was Hunt's last major artistic project, with his eyesight failing and a severe asthma preventing him from further exertions. It is worth lingering over the effort that Hunt invested in this painting. While he was gathering material for the work in Oxford, he also wrote to his friend Edward Clodd (in 1888) stating that he was working from 4 am until 11:30 or 12 "without regular breakfast". Hunt was an old man by this point, and the serious, workmanlike attitude that he assumed merely confirms a continuation of the same dogmatic intensity that sustained him throughout his career.